Written by: The Geek Girl Project on March 26, 2015. On March 26, 2005, Doctor Who returned to television with Christopher Eccleston as the Ninth Doctor and Billie Piper as his companion Rose. It’s been ten years since this new generation of Doctor Who began, and to celebrate, four of our writers share their Doctor Who stories. I don’t remember the first Doctor Who episode I watched. I don’t even know if it was a late Hartnell or an early Troughton, but what I do recollect is running round the playground with my friends, at the age of 6 or 7, pretending to be a dalek. The first episode I do remember watching was ‘Spearhead from Space’ – those creepy shop window dummies stayed in the memory for a very long time, as did the horrible maggots from ‘The Green Death’. We had colour (colour!) TV, Jon Pertwee’s charismatic Doctor, Jo (meh) and Sarah (yay), and (most importantly as far as I was concerned) the handsome, brave, dependable Brigadier. With no re-runs of the episodes or videotapes, it was always a disappointment to have to miss an episode if you had to be somewhere else on a Saturday afternoon. Fortunately, ‘Doctor Who’ was so popular at the time that finding out what had happened was never a problem – your friends would tell you all about it on Monday morning at school. Then – disaster! Jon Pertwee was leaving the show! Some guy we’d never heard of was going to be the Doctor instead! How could this possibly work? Needless to say, within weeks of Tom Baker taking over the role, we were all knitting our own scarves. Last year, I travelled to an event in London where a number of actors were signing autographs for charity. Most of the actors – and there were some well-known faces – had perhaps 3 or 4 people at a time waiting in line to see them. 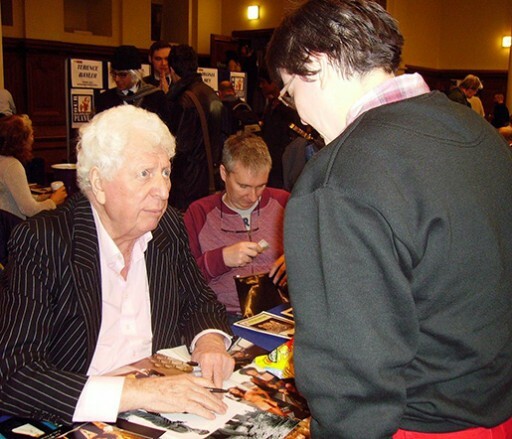 The queue for Tom Baker’s autograph – the line I joined – stretched along a corridor, doubled back into the room and wound around several memorabilia stalls. The Fourth Doctor was last one I watched regularly, though I continued to dip in and out of the series as time allowed, and was disappointed when it was cancelled. I visited the Doctor Who Exhibition at London’s Museum of the Moving Image in the early 1990s; and made sure I didn’t miss the movie (loved McGann, loved the new TARDIS interior, but the plot – not so much). When the series was revived in 2005 I applauded the casting of Christopher Eccleston who brought exactly the right degree of ‘other-worldliness’ to the role. Since then the show has proved to be as uneven in script quality as the ‘classic’ series, but its popularity has soared. I loved seeing Sarah Jane Smith meet the Tenth Doctor, and hoped the Brigadier might be next. Sadly that was not to be, but it’s great that his legacy continues with Kate Lethbridge-Stewart. Anniversary celebrations were enjoyed with friends, gathered around to watch The 50th everything from ‘Day of the Doctor’ to the wonderful ‘Five(ish) Doctors Reboot’. That was followed up a few months later with a Radiophonic workshop concert, where the Dr Who theme was played live for a spine-tingling six minutes. Over the years, I’ve wandered away from the TARDIS now and then; but, like all good companions, I keep returning to it. With Peter Capaldi shaping up to be one of the best Doctors ever, I hope to be watching the programme for a long time yet. Here’s to the next ten years! The newest incarnation of Doctor Who is nearing it’s 10th anniversary and with that comes some nostalgia for our first memories of Who. For me, this starts back when I was 7 and my oldest brother was home from college. He had discovered this great new show and was delighted to find our local PBS station carried it on Saturday afternoons: Doctor Who. Me being the little sister I was growing love of sci-fi I watched along with him, even though I didn’t have a clue what was going on. There was this crazy guy with wild hair and a long scarf who was getting chased by all manners of monster and everyone called “Doctor.” I didn’t know who he was, but I loved him! Then my brother left again and there was this new guy. He didn’t have the wild crazy hair. He didn’t have the scarf. He was blond in this white outfit, and everyone was calling him the “Doctor.” I was so confused and then our local PBS stopped carrying it. Years went by and I started hearing about this movie coming on Fox that was going to be Doctor Who, but set in America. I was so excited. The movie may have been rather silly, but I was in love again. I adored McGann’s Doctor. Granted Eric Roberts’ Master was just ridiculous, but still, McGann! 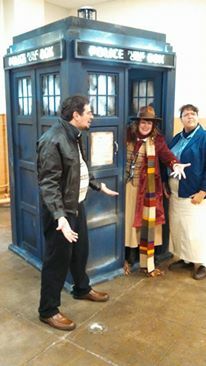 Rebecca with Allie and Rodney as a genderbent TARDIS crew. Years went by again and finally, rumbling about the Doctor coming back yet again and this time on the Scifi Channel (Yes, Scifi. It wasn’t Syfy yet). Then in all it’s glorious British goodness we were all brought into the modern age of Who with Eccleston and Piper! Still more time passes and here we are, I have been blessed to be one of the Geek Girl Project’s resident Whovians with the amazing opportunities to write reviews on Classic Who, New Who, and Titan Comic’s wonderful comic books! Not content to just watch alone, I have happily dragged my friends along with me into this obsession, or should I say, have they dragged me? Between making 4 Doctor Scarves and diving into cosplay with my best friends, this isn’t just an obsession, this is a part of my childhood that I’ve been happy to keep alive. My brother is also still a Who fan and has happily introduced my youngest nephew to it, bring another generation of our family into Who love. I am blessed to come from a woman who was a science fiction geek before that was a cool thing to be. She instilled in me a love of all fiction but most especially the weird, the strange, the fantastic, and the otherworldly. I was very young and she and I enjoyed watching a lot of those strange and weird TV shows together. At least we did once she understood that I’d just stay up late and watch them from behind the couch anyway. 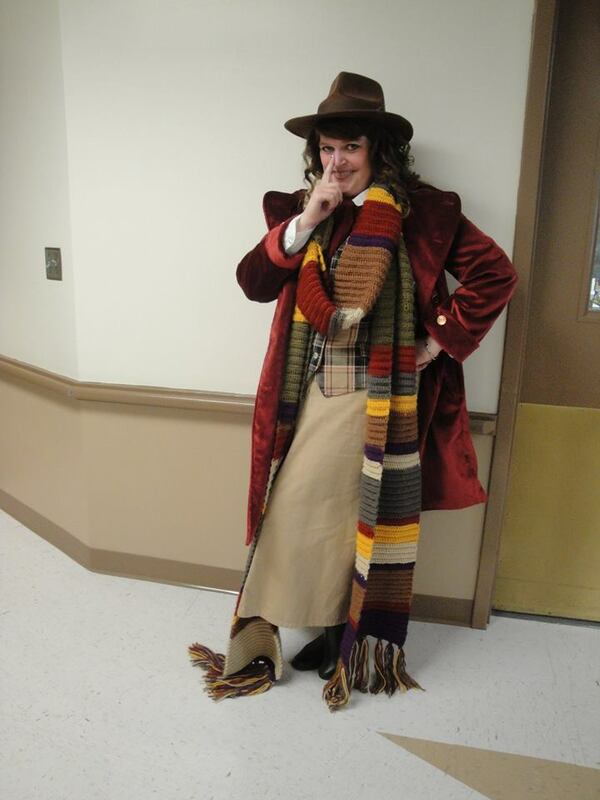 With her, I watched the Fourth Doctor and fell in love with all things Time Lord. With her I watched as he said goodbye and got my tiny little heart broken. When Doctor Who returned to television, I was a new(ish) mom and had already laid the groundwork with Star Trek, Star Wars, and various superheroes. I admit, that glorious first season with the Ninth Doctor I kept to myself in part because I have a kid with an over active imagination and a tendency to scare easy and in part because it was like being with my late mother again. But it was important to me to be able to give my kids the Doctor too. The sound of the theme song thrilled me when I was little as much as it thrills me as an adult. Watching my kids come running to curl up on the couch the moment that song comes on thrills me. My oldest child still says Eleven is his favorite, my youngest loves Nine and Twelve. Thanks to Netflix, we’re watching the old episodes together now too. My mom isn’t around to see my kids but in this way, this sharing of the Doctor, it feels like she’s watching with us. I only hope that my kids can do the same with their kids someday. “We all change, when you think about it. We’re all different people all through our lives, and that’s okay, that’s good, you gotta keep moving. So long as you remember all the people that you used to be.” My favorite quote from Doctor Who. Truth is, though I had never watched it, I had researched Doctor Who once or twice. However, I had never felt compelled enough to actually see what the fuss was all about. An alien traveling time and space in a 1960s telephone booth? It sounded silly. I loved Sci-Fi, I just wasn’t convinced it was my cup of tea. As my statement seeped in, it was like a light went on in her eyes. She got so excited and told me the premise and the basics as quick as she could. “Oh, you have to see it! You’ll love it. Start with Christopher Eccleston, number nine. His first episode is called Rose. Go onto Netflix tonight! I’ll even lend you my password, just go watch it!” Well, how could I say no to that? So, onto Netflix I went. And as I watched The Doctor travel on his adventures, I went with him. And I couldn’t wait to share the show with others. It’s something unique and special. The plot twists! There have been very few shows for me that have had the amount of debate and guessing about where seasons are going to go. New Who and Doctor Who in general have made me think, challenged some of the thoughts I already had about the world. It’s helped me grow as a person. There were so many times that I felt the dialogue echoed what I was feeling, or what I needed to hear. Eccleston was my very first Doctor, so underrated. He’s an awesome place to start. I wish we had more time with him! David Tennant was wonderful. He embodied the character of The Doctor. I completely understand why he’s the favorite of so many. Matt Smith was MY doctor though, the one that I laid claim to, that resonated with me the most. His goofy charm, those “big sad eyes.” I laughed and had such fun with Eleven. He was a best friend. Matt played the young/old man so well. A young, almost childlike, man on the outside, but on the inside an old man who had truly seen too much. I’m currently enjoying Peter Capaldi. I love his “No tears, we have a job to do” approach. A now best friend, introduced me to Doctor Who. I in turn then introduced my brother to it. It became something my brother and I could connect with, we were able to watch it together. Then, I introduced it to others and formed friendships with those people as well. We get together to watch episodes, celebrate milestones for the show that‘s been running fifty-one years. Somehow, being a Whovian has given me an extended family. It’s like a handshake. You like Doctor Who?! We like the same thing! You’re someone I should get to know. Thank you to New Who for getting me started. For anyone reading this who has yet to travel with The Doctor, “All of time and space, everything that ever happened or ever will,” when are you going to start?